Chum salmon, adult. Captured at the mouth of Chico Creek on Puget Sound, in Kitsap County, Washington, on 8 November 2007. The fish was caught on a fly and released. Photo courtesy of Larry Coté. Chum salmon, adult, head. Captured at the mouth of Chico Creek on Puget Sound, in Kitsap County, Washington, on 8 November 2007. Photo courtesy of Larry Coté. Chum salmon habitat. Adult fish captured at the mouth of Chico Creek on Puget Sound, in Kitsap County, Washington, on 8 November 2007. Photo courtesy of Larry Coté. Chum Salmon have an anadromous life history that is typically completed in 3-5 years, with a few fish living up to 7 years. When young Chum fry emerge from the gravel many will immediately swim downstream, migrating primarily at night, without stopping to feed. The juvenile Chum Salmon that do remain within the stream for a while tend to feed on crustaceans and insects. Within the estuary juvenile Chum Salmon diet will change as the fish progress out into deeper water. In shallow water they may feed on copepods and amphipods. As Chum Salmon grow and move further offshore they begin to add crustacean larvae, larvaeceans, euphausids, pteropods, and fish to their diet. Once the Chum Salmon move out into the open ocean they are epi-pelagic and prey on gelatinous zooplankton such as jellyfish. In southern populations of Chum Salmon, adults return to spawn as mostly 3 and 4 year old fish, though in northern populations the spawners are predominantly 4 and 5 years old. 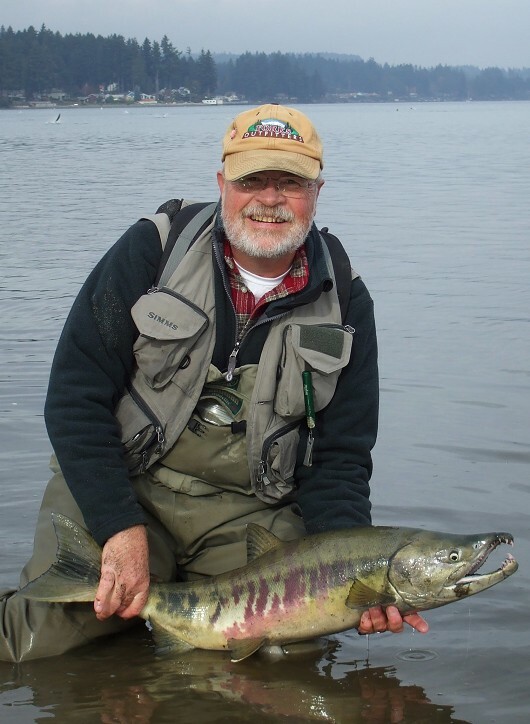 Chum Salmon have two stock classes based upon the time of spawning. Early run Chum Salmon spawn from June-September, whereas late-run fish spawn from August-January. Southern populations (Washington, Oregon, California) are late-run fish that enter a stream when flows increase and temperatures cool. Optimal migration temperatures range from 8.3-15.6°C and optimal spawning occurs within a window of 7.2-12.8°C. Chum Salmon may spawn anywhere from the estuary up, though they mostly spawn within the first 200 river kilometers. Wherever they reach, Chum Salmon return very closely to their native waters and find small diameter spawning gravels with adequate flow and dissolved oxygen (80% saturation). The females dig a series of 4-6 redds in succession in the substrate where they deposit an average of 2,400-3,100 eggs in a downstream to upstream direction. As she moves upstream, the female deposits a decreasing number of eggs in each redd. Male fish fertilize the eggs and may become aggressive and territorial, warding off other fish or “sneakers” who might try to fertilize the egg deposits. Male fish are sexually active for 10-14 days and may fertilize the eggs of several females. Fertilized eggs take 2-6 months to hatch. The emergent alevin remain within the gravel for another 30-50 days living off the sustenance of their yolk sac before rising up into the water column.